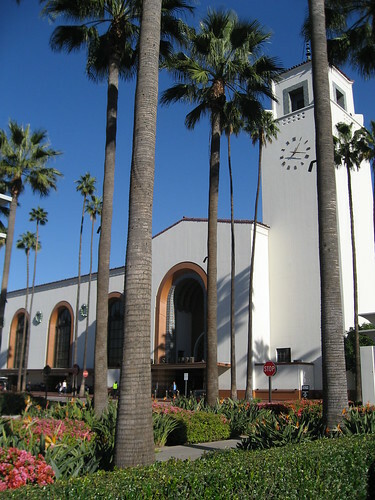 In Landmarks of Los Angeles, McGrew and Julian point to the coincidence of 1939 seeing the opening of both the city’s Union Station – “the last of America’s great railroad stations” – and the Arroyo Seco Parkway – “the first freeway in the west”, stretching from downtown to Pasadena. 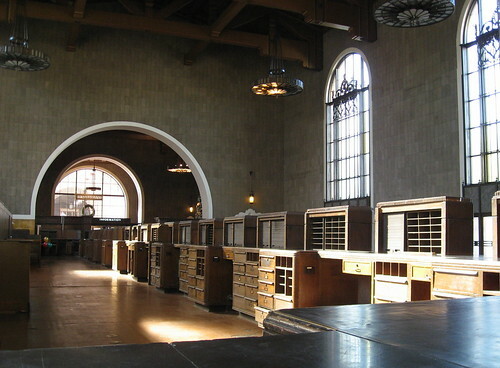 Also, it bears noting that the Parkway more or less began in L.A.'s Chinatown, the community relocated to make way for L.A. Historic-Cultural Landmark No. 101. This is the site, towards the lower right, mainly, of today's Union Station. 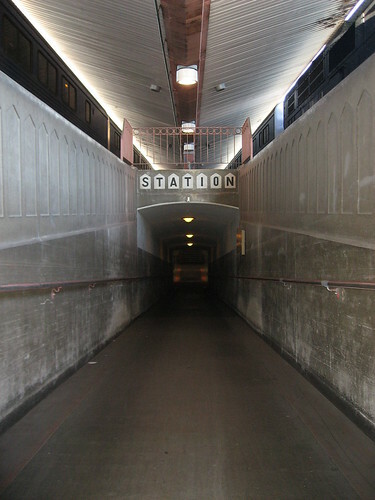 Below is the old ticket concourse. 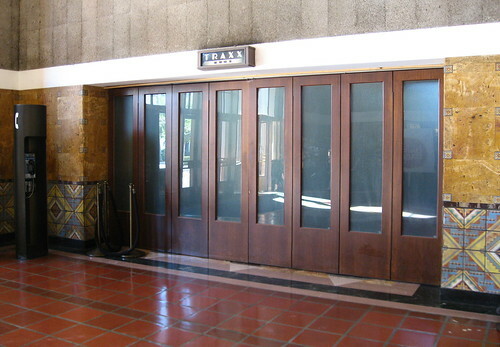 Back in the day, you’d wait in line in front of one of thirty windows to get your ticket. 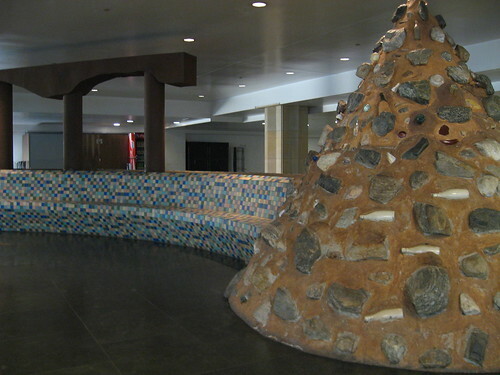 The architectural team of the Parkinsons, John and Don, was hired to build this monument to transportation (Parkinson and Parkinson also designed HCM Nos 278, the Title Guarantee and Trust Company Building, and 575, the Security Savings and Trust Bank, among many others.) 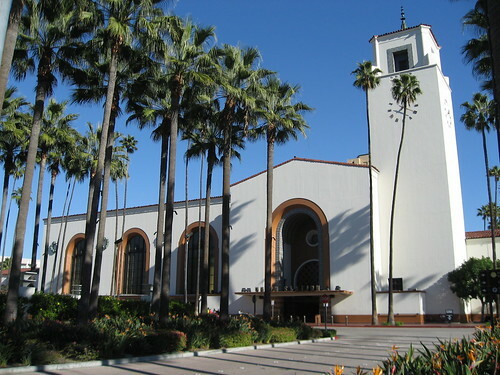 With help from J. H. Christie, H. L. Gilman, R. J. Wirth, color consultant Herman Sachs, and landscaping artist Tommy Tomson, they came up with the resulting design in the Streamline Moderne and Spanish Colonial/Moorish style. 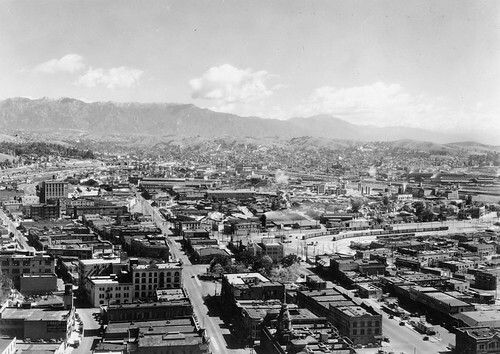 In order for construction to begin, though, the city first had to clear forty-plus acres of L.A.’s Chinatown, moving the community up and over a few hundred yards. Prior to the being Chinatown, the land comprised of acres and acres of vineyards. Poor Chinatown. It's safe to say that, had it been just a year or so later, because of the explosion in automobile use, this railway station would not have been built, and the community would probably still be standing in its original location. 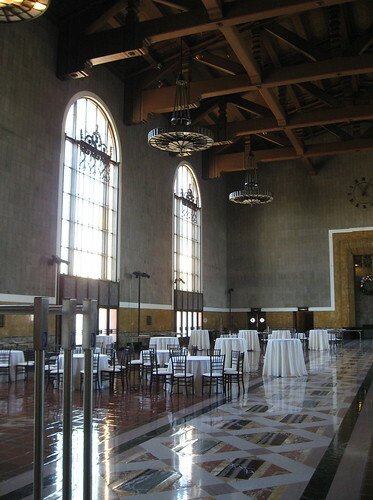 Another shot of the ticketing area, now used for private events. I was at a Christmas party here years ago and had too much to drink. 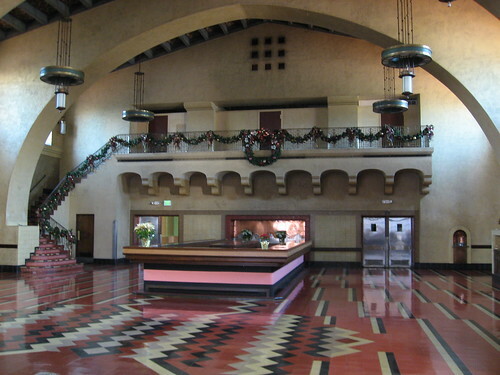 The eleven million dollar building opened on May 3, 1939, and saw one and a half million people pass through its doors in its first three days. 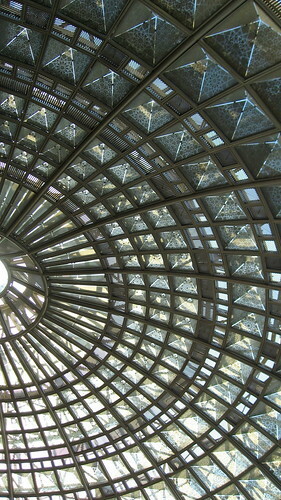 L.A. mayor Fletcher Bowron and Culbert Olson, the state’s governor, presided over dedication ceremonies. There was also a parade, highlighting the history of L.A. transportation, with horsemen, muleskinners, stagecoaches, horse-car trolleys, and an appearance of the Southern Pacific's No. 1 engine from 1869. Here’s the interior waiting room, 52 feet from floor to ceiling. The lower part of the walls is made of travertine marble, and the upper part is acoustical tile made partially of ground corncobs (no lie). 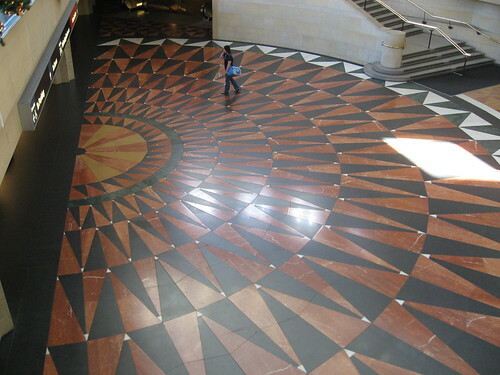 The floor is terra cotta tile and inlaid marble. 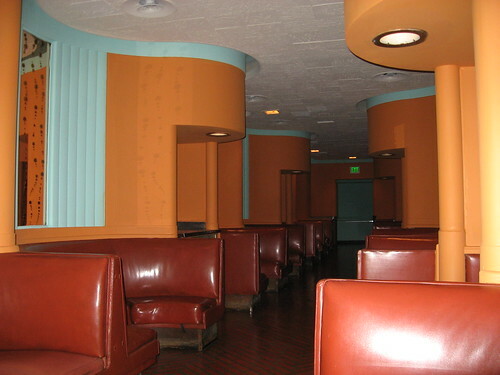 Below is Traxx Restaurant, formerly used by Western Union for sending wires. 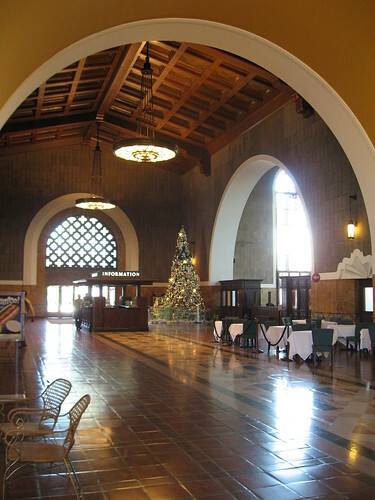 By the time the 1970s rolled around railway passenger and freight service in the U.S had reached its nadir (Union Station was sometimes seeing less than ten passenger trains a day). 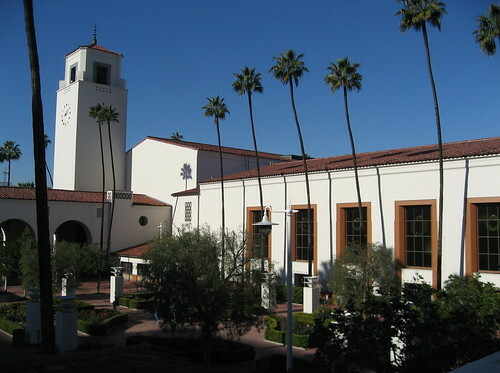 Amtrak began servicing the complex in 1971, but things really began to turn around in the early 1990s with the introduction of Metrolink service followed by the Metro’s Red, Purple, and, eventually, Gold lines. Patsaouras Transit Plaza, an addition opening in 1995, serves bus lines and shuttles. 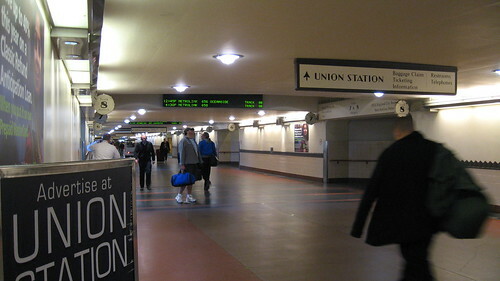 Today Union Station is busier than ever, seeing 201 arrivals and departures daily (the odd number is a result of a single departure/arrival after midnight). 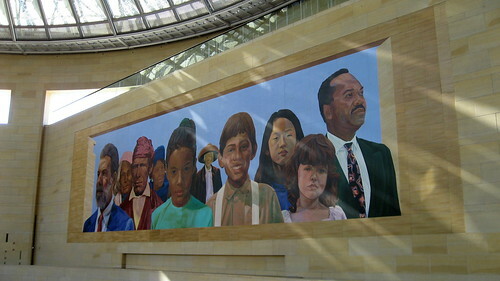 In the 1990s, with renovations and additions to Union Station to accommodate the new subway service, several pieces of public art were commissioned. 1995 saw the unveiling of Richard Wyatt, May Sun, and Paul Diez's "City of Dreams/River of History". The installment includes a few pieces including this 79-foot long mural by Wyatt. Looking up in the east lobby by the mural, you see this ceiling. 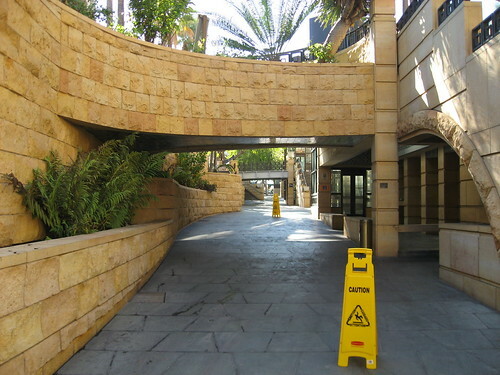 The stretch below, not including the caution marker, is the entrance to 1995's "La Sombra el Arroyo" by the artist team called East Los Streetscapers. 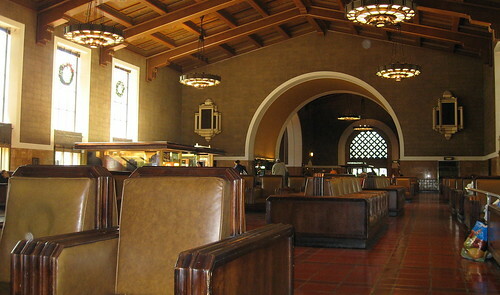 There are enclosed patios are on each side of the main waiting room. 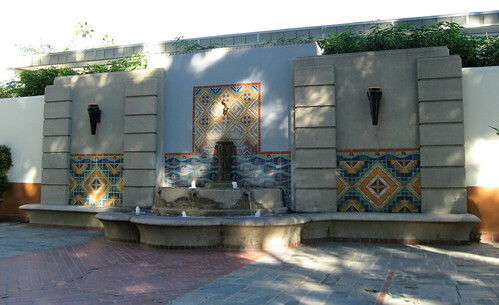 This is a picture of the restored fountain in the north patio. 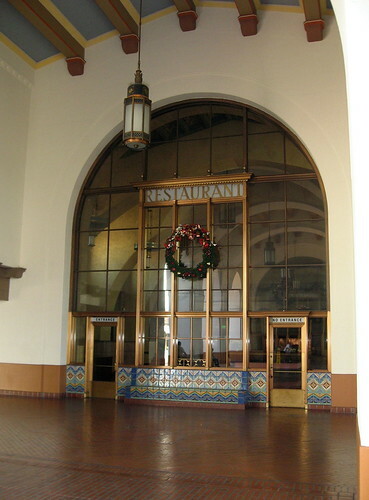 Back in the day, passengers exiting Union Station would leave through the southern garden patio, below. 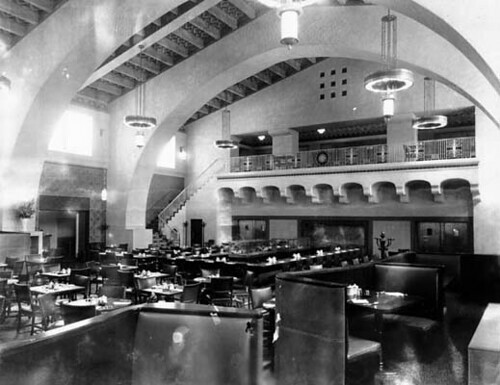 Next to the southern garden held Fred Harvey’s last Harvey House restaurant to be built as part of a railway station. At its busiest, the restaurant served 800 people an hour. 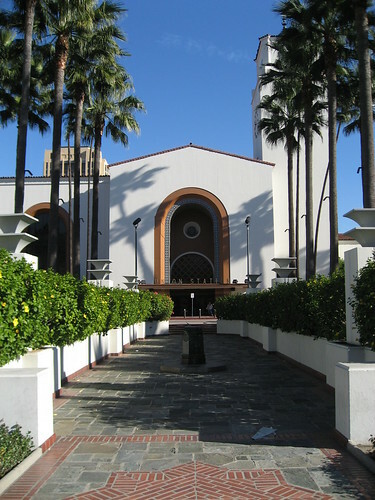 Designed by Mary Colter, Union Station’s Harvey House closed in the late 1960s. It's used today for special events. Also part of the old Harvey House is this small bar and dining area, which you really can't fail to appreciate in person. The clock tower is 135 feet tall. 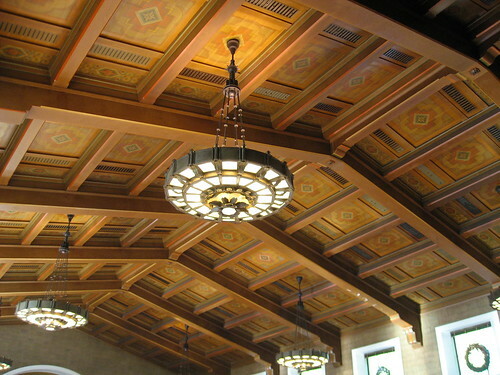 If you haven't yet taken a Los Angeles Conservancy walking tour of Union Station, you really need to do so. They're held the third Saturday of each month, running $10 or $5 for Conservancy members (cheap!). I've spent far too much time reading your blogs this morning, but want to thank you for all of the great information you have collected here. I stumbled on to your blog trying to find more information on the demolished Philharmonic Hall. Go check out the Shulman exhibit at the Central Library, if you haven't already. It closes on the 20th of January. Thanks for the comment and the Shulman exhibit heads up. In fact, I saw it again this past weekend one final time before it's gone. It's very inspiring. Wow, thanks for the comment, Scott. Belated welcome to L.A. 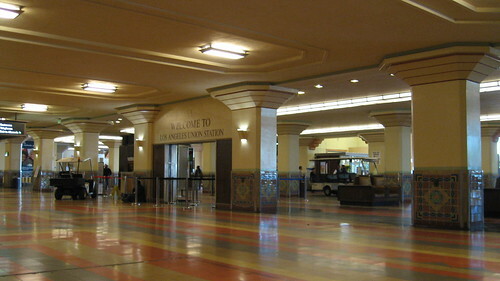 They were still using the old ticket concourse in the late 1970s. 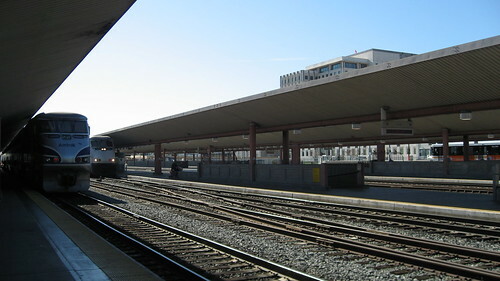 I used to take Amtrak down to Del Mar when i was going to UCSD. The place was always empty or nearly so.